Favorite Farmware Pieces and Where to Shop For Them! 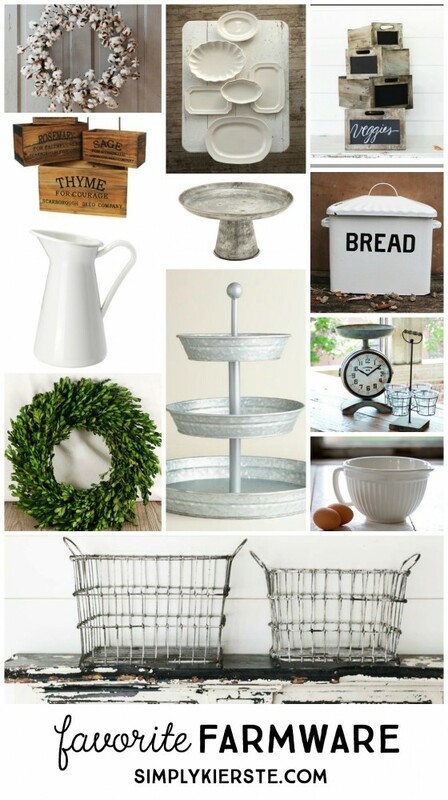 I just love this list of farmware favorites and where to shop for them! They consistently have great finds, but sometimes they’re out of stock, and you have to wait a bit before they’re re-stocked. If you love something there, and it’s in stock–try and grab it if you can, it can go quickly! They offer one steal a day, and usually an extended steal or two. Hurry fast and buy it if you love it–some items sell out in just a couple of hours! Get on their email list, and every day they send out what the steal of the day is. It’s one I check just about every day, because I do love so many of their things. Who doesn’t love Joanna Gaines from Fixer Upper? I adore so many things in their shop! They have pretty good prices, and even though I don’t love everything on their site, it’s easy to sift through and find the gems that I do love. I have several of their boxwood wreaths, and adore them! Yes, World Market! They don’t have a farmhouse style overall, but they do have some, especially in the kitchen area, that I always love. Serving ware, cake plates, beverage containers, plus some of their furniture–okay, I could go on for awhile! Super cute stuff! The prices are a little higher, but if you find something you really love, it might be worth the splurge. I am a huge etsy fan, and I always check there if I’m looking for something specific. If you have another shop or market to add to the list, please let me know–I’d love to hear about it!! Yep, Target! They’ve joined the farmhouse revolution, and have a bunch of farmhouse style products.